We seek to combine expertise with approachability to work in partnership with our instructing solicitors to secure the best possible outcome – and the best possible experience of the legal process leading up to that outcome – for the lay client. We have a very strong team of barristers. Our barristers have won awards at every level of seniority over the last year, from Head of Chambers to junior tenant and including new silks and senior juniors too. As leading practitioners in our fields we have 166 recommendations in the legal directories across 12 fields with band one set rankings for Clinical Negligence, Inquest and Inquiries, Police Law (mainly defendant) and Professional Discipline and Regulatory Law. We have further set rankings for Administrative and Public Law and Product Liability. We are one of Chambers & Partners’ top 25 sets for rankings per number of barristers. We appreciate that legal skills are only part of the package and we are committed to keeping our service as strong as our legal work. We are one of Chambers & Partners’ top 20 sets for client service and we have featured in numerous client service awards over the last two years. No fewer than seven members of staff are individually recommended by the directories. 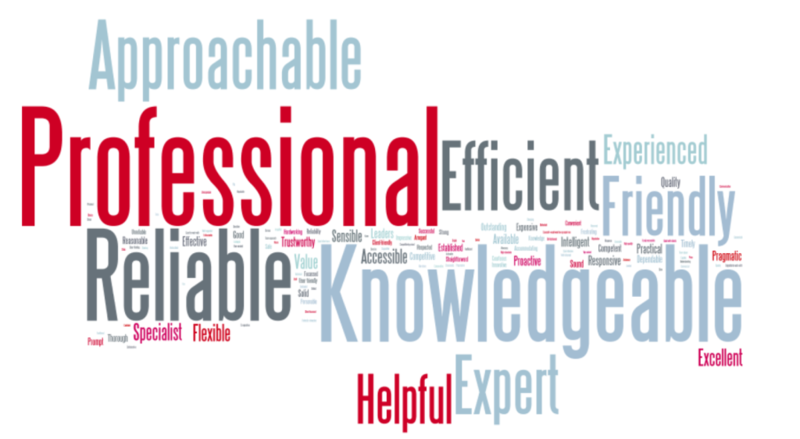 We conducted a survey of nearly 3,000 clients and asked them which five words they would use to describe us.